Cotton is a natural fabric that is absorbent and allows air-flow. That’s why a cotton shirt will keep you comfortable during humid weather. The fabric absorbs sweat easily. Opt for pastel coloured cotton casual shirts in summers when humidity is at its peak or if you are susceptible to skin allergies. You can style a white cotton shirt with a pair of blue jeans or a high waist circle skirt. Roll up the sleeves to the elbow, add a pair of tan loafers and head out for an al fresco July dinner date. Polyester is light-weight, resistant to stains and wrinkles, and dries fast. A polyester casual shirt rarely shrinks and is a perfect workhorse of a shirt. Take it to a rigorous day at the construction site or a long day in the kitchen whipping treats for the kids; this shirt will be your best bet. Want more? A smooth fabric like polyester makes your body look more streamlined. It adds smoothness and durability when used in combination with other fabrics. Go for a shirt with a mix of polyester and cotton to wear in the cooler months. Silk shirts are soft to touch, lustrous, and lightweight. Besides being super dressy, these shirts don’t wrinkle easily and are durable too. Wear a silk shirt underneath a cardigan or a blazer to add an elegant touch to your look for a cocktail party. A dark coloured silk shirt paired with a light coloured bottom for an evening party will do wonders to your sartorial taste. Women can pair a neutral coloured silk shirt with an eye popping printed mini skirt for a glamorous look. Linen shirts are light-weight, breathable, and an epitome of contemporary summer dressing. The fabric is gauzy and wrinkly, which is what gives it a casual look. Roll up the sleeves of a classic white linen shirt to the elbow and pair it with jeans or peplum pants for a garden tea party. 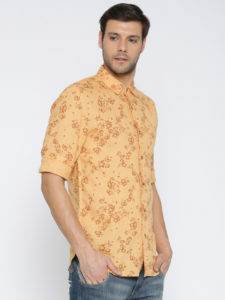 Short-sleeves linen shirts in light shades are best suited for the warmer months and can be worn for casual functions. Team dark-coloured linen shirts with lighter coloured bottomwear for a muted contrast. If you don’t walk with the crowd, nothing screams that better than a denim shirt. Rebellious at heart, a denim shirt is sturdy, stiff, and can take you from the workshop to pub hopping in minutes. There are several cuts and washes in denim shirts that you can try. 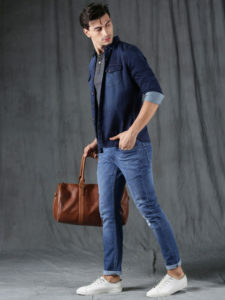 Pair a casual denim shirt in cowboy style with black jeans and high top boots to look uber cool. A denim shirt can be used as a jacket over a light-coloured camisole too. If set for an evening bash, pair it with leather trousers and accessorise with metal jewellery, like gold or silver hoop earrings. Thick fabrics like wool block air and keep you warm in winters. Therefore, a thick wool shirt will not just keep you warm, but would be a durable companion too. Layer a plaid wool shirt over a printed T-shirt and a suede knife pleat skirt. A neutral-coloured casual shirt in wool can be worn beneath a faux-fur jacket with a pair of boots. The accessories you can try out are mufflers, bags, hats, shoes and jewellery. These shirts are cut to fit a leaner body shape and have darts in the back. 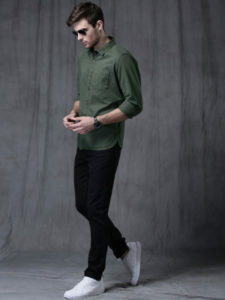 Men who love to flaunt their chiseled bodies will take their look a notch up with slim fit shirts. If you’re a lean or athletic body type this is the shirt for you. Go for a regular fit if you have an average body built and looking for a decent breathing space. This style of shirt holds close to your body without being too clingy. Keep the shirt untucked or tuck it in slightly for a tapered look. Club it with vintage bell bottoms and leather pumps for an added flourish. This style is apt for those who fall under the heavy body type and like a roomy and comfortable fit. If out on a lazy evening with friends, wear a classic fit herringbone shirt with a pair of relaxed sneakers and acid wash jeans. A classic fit white casual shirt is a must-have for your everyday wardrobe. Team it up with soft hue high-waist trousers for a casual classy look. Taking right measurements beforehand will save you the hassle of going through the inconvenience of returning or exchanging your purchase. The size of a shirt may vary from brand to brand, depends on the material, and may vary due to other factors. So, how do we measure ourselves, you ask? Stand in front of a mirror and measure your chest first using a tape measure. Avoid using a ruler or retractable tape lest you get misleading results. Run the tape underneath and around the rib cage at its widest point to get your chest size. The chest size of the shirt chosen may vary between two to six inches than your actual chest size depending on the kind of fit. The next step will be to measure the waist. Comparing the size of the shirt with the ones you already have always helps too. Once you are done taking these measurements, refer to the charts below to gauge your size. Women have additional options of sheer casual shirts with georgette, chiffon, lace, satin, and even more fabrics. You can go for even more cuteness by picking shirts with features like ruffles, bib pleats, belted waist, bows, and puffed sleeves. Leave your casual shirt loose or tuck it in with a sleek belt for a fitted look. Printed shirts go well with skinny jeans and high heels, whereas a Chinese collared shirt with puffed half sleeves looks stylish with a tapered trouser and ballerinas. Wear silk shirts in jewel tones with high-waist printed skirts. Leave two or three buttons from the top unbuttoned to make the outfit look glamourous. Try multi-layered or a gemstone beaded necklace for an eclectic look. Accessorise chiffon shirts with long necklaces, scarves, and belts. Let the scarf hang loose. Of course, we haven’t left the boys out! A dressy, glazy bright-coloured casual shirt with a pair of sober jeans or trousers is perfect to be worn to a disco or a pub. Go for casual shirts in colours like red, violet, blue, black, and grey for evening parties. Give your casual shirt a bold colour treatment during winters with casual shirts in colours like brick red or lavender. Layer a coloured casual shirt with a solid-coloured cardigan or a sweater and khaki trousers for a laid-back look. Casual shirts can be worn to the office, a casual lunch date, or a picnic with the family. Wear them with shorts, skirts, three-fourths, or even trousers; either way we promise you’ll turn out looking well put-together. You can take your look up a notch or stay understated with a casual shirt. The trick is usually in how you style your shirt and the occasion. When picking casual shirts online, choose something that gels with your complexion and body type, and look trendy at the same time. You can go for party wear casual shirts, rugby shirts, golf shirts, and the works; if there is a casual shirt you want, we have it! Go for these seasonless casual shirts and make looking good a habit.